Omotola visited the famous Yaba Tech for the first time she graduated from the higher institution. 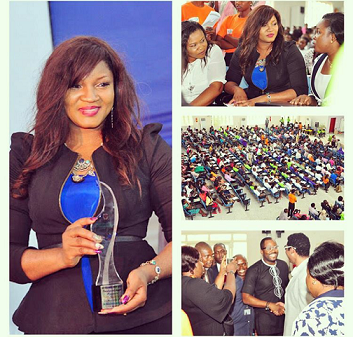 Super star actress Omotola Jalade-Ekeinde was mobbed by fans at her alma-mater Yaba College of Technology recently. Omotola visited the famous Yaba Tech for the first time she graduated from the higher institution. She was invited as a guest at the first ever World Youth Skills Day, a UN initiative to promote skills acquisition as another form of education and eradicating poverty. Actor and house representative Desmond Elliot, and designer Mai-Atafo attended the event also.